Here are some general questions and answers about silent films. If you have a specific enquiry about early and silent cinema, particularly if you are researching aspects of silent film history, please use the comment box at the bottom of this page to post your question. I’ll try to answer what I can (or find someone who can), and post answers on the blog where suitable. If you would rather get in touch privately, contact details are on my personal site, www.lukemckernan.com. Q. How do I found out more information on a silent film? A. There is no central register of silent films, either those that were made or those that still survive. The nearest to a central register in the Internet Movie Database. However, this does have to be treated with caution. It does not have everything, and for the silent era in particular it has many gaps and inaccuracies. The databases of the many film archives around the world are a good guide, though the filmographic information available is uneven, and naturally they limit their records to what they hold. Contact details and links for archiv es worldwide can be found on the Federation of International Film Archives (FIAF) site. The best sources are the various national filmographies that have been produced. Examples include Denis Gifford’s The British Film Catalogue, Lundquist and Luritzen’s American Film Index 1908-1920, the American Film Institute Catalog, and the Filmographie des longs métrages sonores du cinéma français. FIAF has produced Treasures from the Film Archives, which started out as a book publication listing extant silent short films around the world, and is gradually expanding in disc form to cover silent features and non-fiction titles. There are a number of excellent online databases which list silent films made as opposed to those which which survive, aside from the IMDb. The American Film Institute makes its catalogue 1893-1930 freely available to all. Do note that for 1911 onwards the catalogue covers features only – for a comprehensive record, cross-refer to Lundquist and Lauritzen’s American Film Index (not available online). The British Film Institute’s collections database is an exceptional resource, though the information on silents ranges from the amazingly detailed to the frustratingly slight. Another good source is Germany’s Filmportal. Q. Where can I find information on silent film personalities? A. The Silent Era site is a good place to start, with its many star biographies. There are many individual websites for silent film stars – check the People section on the links given on the right-hand side of this page. Among the many printed sources, good guides include the Encyclopedia of British Film, the Encyclopedia of Early Cinema and the Macmillan International Film Encyclopedia. Q. Where are silent films held? A. Silent films exist in three main places: public film archives, commercial company vaults, and with private collectors, though for most they exist chiefly on the racks of video stores. A list with contact details for most of the public film archives is given on the FIAF website. Such archives will vary in the degree of access they can provide, and whether there is a charge involved in viewing films. Always make an appointment in advance if you are planning a viewing. Note that just because an archive holds a film does not necessarily mean that you can see it, because they may not have a viewing print available. And remember that most public archives do not own the rights to the films that they preserve, and do not usually allow copies to be made for private users. There is no central catalogue of extant silent films, though the FIAF Treasures from the Film Archives disc aims eventually to develop into such a resource. There are union catalogues bringing together data on collections from several archives: Moving Image Collections (MIC) and the European filmarchives online. Commercial companies, film and television, will hold silent films, but public access to such archives is nil. One source worth knowing about is WorldCat, an attempt at a universal library catalogue, bringing together the databases of many libraries worldwide, often including their video/DVD collections. Q. Where can I buy silent films on DVD? A. If you are in America, or are seeking Region 1 DVDs, the best place to start is the list of DVDs provided by the Silent Era website. A list of some of the key retailers is given under DVD and Video in the list of links on the right-hand side of this page. These include Eureka, Kino Lober, and Milestone Films, while more unusual films (which generally means non-fiction) may be found at the British Film Institute or Edition Filmmuseum. 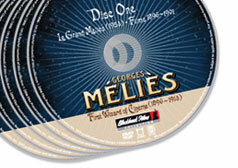 General retailers with good silent film lists include MovieMail (in the UK) and DVD Planet (USA). Q. How many silent films have been lost? A. Calculations on this vary, but the figures usually quoted are 80% to 90% of all silent film production worldwide. For some countries, such as Japan, the figures is in the high nineties. Thousands of silent films were junked when they became financially worthless, notably with the arrival of sound films. The first national film archives did not become established until the mid-1930s, partly in response to the loss of the silent film heritage, but by then it was too late for many silents. Discoveries continue to be made, both individual titles and entire collections, but the majority of silent films made 1894-1929 are lost for good. See the Bioscope post Losing films for more information. Q. I’m just getting interested in silent films. What should I see and what should I read? A. What you should see is down to individual taste, but a good starting point would be to investigate the ‘Top 100’ silents voted for by readers of the Silent Era site and try and check out the top ten. It’s hard to disagree with choices like The General, Pandora’s Box, Metropolis, Sunrise and The Passion of Joan of Arc. For the non-fiction film, try Electric Edwardians, or Man with a Movie Camera. As for reading, most would say Kevin Brownlow’s The Parade’s Gone By or Walter Kerr’s The Silent Clowns. There’s a ‘top ten’ reading list suggested on The Bioscope. Q. Where can I see silent films screened? A. There is nothing quite like seeing a silent film screened in an audience, with live music. The Silent Era maintains a selective listing of upcoming screenings in the USA, while Nitrateville has news of American and British screenings. Silents are often show as cinematheques and specialist film theatres: in the UK, check out the BFI Southbank and the Barbican in London. Q. What silent films can I find online? A. Legally or illegally? There is a huge amount of silent film available one way or another online, but it is sad to see films which have been ripped off DVDs painstakingly put together by companies like Kino and Milestone, often at much trouble and expense. Among the wholly legitimate sources, see the Bioscope’s guide to online silent video sources. Q. Where else can I join in discussions on silent films? A. The best place is the discussion forum, Nitrateville which populated by knowledgeable and obliging enthusiasts. Another, well-established forum is Golden Silents. A more fan-oriented list, is the Yahoo Group for silent films. Q. Aren’t all silent films in the public domain? A. No. Film copyright is an immensely complicated field, which people want to see simplified for their own advantage, inevitably. Firstly, there is more than one kind of right which can relate to a film – not just in the film itself, but in the literary rights, music rights, the rights in new intertitles etc. Rights also vary from territory to territory, and different countries have different laws, of course. And rights also vary according to whether you are talking about screenings, commercial releases, use of clips in other productions, etc. Moreover, films that were once out of copyright may have come back into copyright, owing to change in term decreed by new laws. For the USA, you can check through the Copyright Office databases, or consult with the Library of Congress. All films published in the USA to the end of 1922 are public domain in the USA, bar a handful of exceptions (but note that these films may have copyrighted elements, such as a new score). For a guide to USA copyright, see www.copyright.cornell.edu/resources/publicdomain.cfm. The UK does not have the same concept of public domain as exists in the USA, where copyright has to be renewed. In the UK, film is treated the same as other creative works under the seventy-year-rule. That does not mean seventy years after the film’s production, but seventy years after the death of its principal creators: usually the director, producer, art director and writer. The British Film Institute should be able to advise on specific titles. In general, never assume, always take advice. Q. Where do I find cinemas from the silent era? A. There are a number cinemas still operating which were showing films in the silent era, through very few from before the First World War period. The best single source is the worldwide directory of cinema, Cinema Treasures. There are some national guides, such as The London Project, the Utrecht Project, and the huge Dutch database Cinema Context. Q. How can I find work in film archives? A. Have a worthwhile skill. Check out the training courses and qualification schemes worldwide. A summary of some of these is given on the FIAF website. Q. What was the first…? Thanks for adding the “questions” rubric. It’s a great addition to the website. Here’s a quick question, which I think should be easy enough to answer. Was D.W. Griffith’s 1912 Biograph film MAN’S GENESIS a one-reeler, as I believe, or not? I’ve been working with Vachel Lindsay’s THE ART OF THE MOVING PICTURE, in which he discusses the film, so I googled the it and found that it was supposedly a one-reeler. I was satisfied with this info and stopped worrying about it. But then, as I was looking through the appendix to the Modern Library edition from 2000, I found Kent Jones identifying the film as an “ambitious five-reel prehistoric tale” (p. 190). This sent me looking again, and I went first to the AFI catalog, but, unless I’m just not looking right, it seems that there’s a big gap in their coverage of Griffith’s films between 1910 and 1914. Can anyone confirm the length (a rough count of reels will suffice) of the film? MAN’S GENESIS was definitely a one reeler. It was released 11 July 1912, one reel, with the paper print copy in the Library of Congress being 414ft (16mm), or 18 minutes at 16 fps. All this information from the Pordenone silent film festival catalogue for 2002 – the festival’s Griffith Project has been showing the whole of Griffith’s surviving work in chronological order for some years now, while an effective catalogue raisonee is being published in multiple volumes as The Griffith Project, edited by Paolo Cherchi Usai. MAN’S GENESIS (project no. 419) is described in volume 6. Kent Jones’ error may come from a misreading of Robert Henderson’s book D.W. Griffith: The Years at Biograph, which has a 5 next to the title in the filmography, but that means the month in which it was filmed. The film doesn’t appear in the AFI Catalog for the 1910s, because this covers only feature length films – hence much of Griffith’s later Biograph production is not listed there. An alternative source to use is Einar Lauritzen and Gunnar Lundquist’s two volume American Film Index of all films made in America 1908-1920. A good university library with a credible film section ought to have one (also Paul Spehr’s invaluable index to the book by personal and organisational name). Thank you so much! You’ve not only answered my question but filled in some fundamental gaps in my knowledge of the basic resources available for researching early and silent film. On a related note, I really hate to make so many requests, as you’ve obviously already invested so much time and effort into making this website an invaluable resource, but perhaps a good replacement for the defunct “publications” section would be something to give people a basic orientation in just such matters: what catalogs are available, what do they cover, how are they best used to complement one another, etc.? I for one am coming from outside of academic film history (my field is American studies), and I suspect many others who come here are lacking the orientation provided in university studies of (early) film. You’ve already done a great service here in pulling together links and resources. Perhaps you could give this type of thing a space of its own, a base of operations where people can gain their bearings and pursue the most relevant direction. This wouldn’t have to be limited to catalogs. It might also be a good place to pull together the databases, film archives, and organizations listed on the right-hand side of the screen, so that people know (which I didn’t) things like the fact that the AFI catalog is limited to feature-length films. Again, this is only an idea that occurred to me now, and I hope I don’t come across as pushy with all my “requests.” I’m just so impressed with the efforts represented here and thinking of what would, from my perspective, make it even better. Please feel free to disregard this, though, and keep doing what you’re doing so well. I will try and do some, if not all of those things. Time is the problem, inevitably (I do have a day job) and it takes time to do these things well. Some sites such as Silent Era provide excellent general information on silent film, and there’s no way I’m going to try and emulate those, but general guidance on research resources I’d be happy to provide. Eventually I’d like to see The Bioscope expand beyond a blog to become a general invformation site, but that’s a little way off yet. Anyway, I’ll do what I can. Thanks for all the great work ! I followed your suggestion on the British Pathé dowloads and am overwhelmed by what’s available ! I was wondering if you knew of another resource that would also offer newsreel items (preferably US) from the 1920s, free for the taking ? Check my earlier post on British Movietone, which makes the whole of its collection freely available online (streaming only). The newsreel is post-1929, but there is earlier material there from the Henderson Collection of early actualities. I’ll do a proper post on silent newsreels online from around the world some time soon. Over the past several years I have written several articles about silent film artists that were born in the State of Utah. I was amazed not only how many people I have found, but the important films that they have been part of. For example, Salt Lake City born Margaret Livingston had the third lead in F.W. Murnau’s SUNRISE; Mack Swain is Chaplin’s co-star in THE GOLD RUSH; director and actor James Cruze was responsible for THE COVERED WAGON; actor turned director Frank Borzage received the very first directing Oscar for his SEVENTH HEAVEN; John Gilbert became the highest paid contract actor in the business and won lasting fame for his work in THE BIG PARADE and opposite Greta Garbo in FLESH AND THE DEVIL; Marion Mack happend into lasting fame by appearing opposite Buster Keaton in his masterpiece THE GENERAL. actress Betty Compson was the star of Josf von Sternberg’s THE DOCKS OF NEW YORK, and Salt Lake born Loretta Young who co-stared with Lon Chaney in LAUGH, CLOWN,L etc. Another Utah born star was HAZEL DAWN. She found fame in England and Broadway in major musical and comedy plays, including THE PINK LADY. Dawn’s charm, voice and musical abilities with the violin made THE PINK LADY the most popular musical of 1911. The operetta ran 312 performances and shattered the existing attendance record for the New Amsterdam Theatre in New York, which was followed by a triumphant run in London. In 1911, the young movie industry was struggling to win respectability, gradually evolving from one- and two-reel films to features running 60 or more minutes. Producer Adolph Zukor had formed The Famous Players Company, and he became the first to present Broadway stage stars and plays in motion pictures in a regular way. Zukor brought from the stage such memorable movies stars as Mary Pickford, John Barrymore, Geraldine Farrar, Mae Murray and HAZEL DAWN. Dawn made her film debut in a drama called ONE OF OUR GIRLS (1914). From 1915-16 she appeared in a staggering nine films for Famous Players, filming one after another during an 15-month period. These included such titles as: THE MASQUERADERS; ONE OF OUR GIRLS; NIOBE; GAMBIER’S ADVOCATE; THE HEART OF JENNIFER; THE FATAL CARD; MY LADY ICON; THE SALES LADY. Dawn returned to the stage in THE CENTURY GIRL (1916) and with the exception of a crime film, THE LONE WOLF (1917) for Selznick Pictures, and a society melodrama, DEVOTION (1921) there would be no more film appearances. Unfortunately, most of the Famous Players negatives were lost in a lab fire. My question is: Do you know of any film titles that Hazel Dawn appears in that survive? I would love to find some moving images of her and/or an early recording of her singing voice. – there’s some very knowledgeable people there. Of course she can be seen in the sound film MARGIE (1946). I recently blogged in http://blog.stummfilm.info/2007/09/27/lost-filmseu/ (sorry German) some news about a project for “Lost films”. Many thanks. I’ll definitely post something on this myself. Apart from the practical nature of the exercise, the whole cult of the lost film is something worth contemplating. Dear Sir , I am researching my uncle who was a member of the Eight Lancashire Lads Clog dancing troupe. The same time as Charlie Chaplin It has been stated that a film , bioscope of Chaplin performing with the Eight Lancashire lads exists. I know this is a long shot but could you advise me on who may hold this film . No film exists of the Eight Lancashire Lads, with or without Chaplin. Rumours have abounded various films supposedly made of Chaplin before he left for America, but all seem based more on wish-fulfillment than hard reality, and certainly none exists. Sorry. What was your uncle’s name, and at what period was he a member of the troupe? Chaplin was with the troupe 1899-1900. The Eight Lancashire Lads troupe seems to have lasted from the 1890s to the 1930s at least, and maybe beyond, so there were many changes of personnel. I don’t know of any list of names, but the best person to ask would be Max Tyler, who is historian of the British Music Hall Society – his email address is maxt [at] hist.freeserve.co.uk. There is also a brief clip of the troupe in 1931 on the British Pathe website, at http://www.britishpathe.com. On this site you have the name mentioned of Solomon Gabriel Newman, who and where do I find more out about him, as he is part of my family, would love to know more about him and his life. All I know about Solomon Gabriel Newman is that he joined the British film industry’s masonic lodge (the Anima lodge) in 1918. I got this information from a list of members of the lodge that I have. I’ve not come across his name before, and can’t find him in any reference book. He was clearly a member of the film industry in some form. The only likely place to find out about him would be in a trade year book, such as the Kinematograph Year Book, for 1918. I have access to these at work and will see if I can find him – unfortunately, there isn’t a name index! I’m a regular reader of this blog, hoping that I can get some sort of guidance in collecting bibliography for a paper. I’ve been looking everywhere for a comprehensive overview on the usage, history, style, narrative role, etc. of the intertitles in the silent era. I’ve found only passages or short chapters on the topic, as Andre Gaudreault’s essay in the Early Cinema. Space. Frame. Narrative book, or some vague chapters in film histories. Could you recommend me something else on the subject? Interesting question. I can’t think of any one good source that covers the subject thoroughly. There is a useful chapter in Eileen Bowser’s The Transformation of Cinema: 1907-1915, in the History of the American Cinema series. Rachael Low has a good discussion of titles in British films in History of the British Film 1918-1929. Barry Salt talks about intertitles (mostly along the lines of when they first appeared) in his Film Style and Technology. Martin Sopocy’s James Williamson is very specialised, but does have quite a bit of discussion on intertitle styles. And for examples of intertitle style, do check out Intertitle-o-Rama (http://www.geocities.com/emruf5/) – check also some of the links at the bottom of the page there. There was a conference on the silent film intertitle about five or six years ago – or was the special issue of a journal? I vaguely remember the call for papers, but I’ve not been able to find any record of it. Unfortunately I don’t have access to all of the titles you’re recommending, but thank you for your help. I’ve made a new search on the internet, and I’ve found two titles that contain chapters on intertitles: Kamilla Elliott: Rethinking the Novel/Film Debate (2003) and according to a blog: Kevin Brownlow’s book, The Parade’s Gone By. The forgotten conference on silent film intertitle can be the *Writing and Image in Silent Film* conference in Udine, 1996. No wonder it is forgotten, because there does not exist any written information about it on the internet. The papers were collected in a book entitled: Francesco Pitassio, Leonardo Quaresima (a cura di): Scrittura e immagine. La didascalia nel cinema muto. Atti del IV Convegno internazionale di studi sul cinema, Udine, 20-22 marzo 1997. ISBN 88–86756–37–2 (Italian). Thanks so much for this. Can’t believe that it’s eleven years ago already… I’ll let the enquirer know. I write in response to the emails regarding ‘The Eight Lancashire Lads’. My Nan’s uncle, Ernest Manion was a member from c. 1910 to c. 1914 (possibly later). He was performing with them in Germany when war was declared in 1914 I’m told, but they were allowed to return to England due to the young age of some of the eight-strong troupe. I have also just located Ernie on the 1911 Census with another potential member – Louis Coltham, stated as being ‘visitors’ at a residence in London. I would be interested to exchange any related information with people. Hi. It’s not clear, despite the FAQ, how one can subscribe to your rss feed. Usually there is a little rss icon or something somewhere to use to subscribe. Any hints? I usually use safari to subscribe. An orange square with white curved lines should appear somewhere in your browser, which indicates that there is a feed you can subscribe to. You just click on the logo or copy the blog’s URL and add it to an RSS reader, if that’s what you use. The feed’s address is https://bioscopic.wordpress.com/feed/. I’ll rewrite the FAQ to make it clearer. Thanks. I should have been clearer as well: no little RSS icon appears in Safari or Firefox. The feed link suffices though. Thanks for a very interesting, useful and intelligent site! Thank you. I use Firefox and I get an orange icon appearing in the browser window, though the icon with the letters RSS is something you have to place within the main body of the site. I’m not quite sure how to do this, given the restrictions over what I can do with WordPress, but I’ll investigate. Please can someone tell me where best to advertise a silent film screening in London. It’s the Keaton double bill 35mm projection event at Catford’s Broadway theatre on Oct 18th with live theatre organ accompaniment I’ve mentioned on here before, but was told you don’t allow individual screening ads. I’ve tried the silentfilms yahoo group although that is mainly USA based. PS Just a thought, but could you not have an extra section of this website which enabled short posts by individuals advertising screening events? It could easily be self-managing and require no input from the webmaster. I don’t advertise individual screenings in general, not because I don’t allow them, but because I can’t do them justice – I can’t keep up with them, and I don’t want to have a tokenisitic representation. I try to keep the Bioscope within its particular scope. The idea of having individuals advertise screenings is interesting in principle, but the blogging software is not really suitable for the purpose, and I do not believe that there would be sufficient contributions to make it useful. Moreover, there are places where it is better to advertise screenings. I recommend Nitrateville, which is read by many silent film enthusiasts in the UK – it has a silent screenings section, here: http://nitrateville.com/viewforum.php?f=12&sid=f700aa803af1e37a0c17844a2ecbff94. You have to join the forum first, but it’s simply a case of registering. Other forums you could use are http://www.silentcomedymafia.com/, http://www.silentcomedians.com/index.html and alt.movies.silent (http://groups.google.com/group/alt.movies.silent/topics?hl=en). http://www.busterkeaton.com/, which carries news on all things Keaton. I am a student of design and my project is based on forgotten Indian objects, the bioscope is one of them. I require images of the bioscope itself (indian version) for my research and cant find one to photograph in my city. It would be a great deal of help if you could send images. the Bioscope? I’ve got some film clips on my website. it is Fremont (really it should read Niles) CA not VA.
I’ll change Fremont to Niles and VA to CA, but I can’t keep up with every biography or indeed amend every past post when new information comes in (there are over 1,100 posts on this site to date). I’ll correct errors of fact and make changes where something substantial occurs, for accuracy’s sake, but for the most part a post written in December 2008 has to stand as it was in December 2008 (even though I do add new musicians’ names as I come across them). First of all, thank you very much for this wonderful and informative website! I am an MSc Film Studies student at the University of Edinburgh, and I have a special interest in the silent film era. At the moment, I am working on my PhD proposal, for a topic that will include researching a lot of obscure or lost silent films in different archives. I was wondering if you had any information on where I could look for research grants that are specifically relevant to silent film? I would really appreciate any suggestions! I know of no research grants specific to silent film. Those academic research grants which have been awarded to silent film-related projects have all come from regular funding sources, notably the AHRC, the British Academy and the Levehulme Trust. My experience is limited to the UK, but I don’t know of any international grants that focus on silent film. One or two grants get given out which relate specifically to film (the David Lean Foundation, for example), and some universities may occasionally offer research scholarship on a film theme. Take a look at the assorted directories of grant making trusts which you can find online for further information on funding sources – many require a subscription payment but http://www.acf.org.uk does not, or look up the comprehensive Directory of Grant Making Trusts (print publication only). what a wonderful surprise this early morning (06:53) has offered to me – discovered the bioscopic site! It’s great. So many useful and most interesting information here for fans of Silent films! Thank you! Thank you – we aim to serve. Sadly both Drakula Halala and Life Without Soul are believed to be lost films, so finding a DVD of either of them is impossible. There isn’t a place on this website for such invitations, and I don’t want there to be one, but I’m happy at least to leave the link in your comment. At the time of the Moon landing, three stations – Goldstone in California, Honeysuckle Creek in Canberra, and Parkes in New South Wales – simultaneously recorded the events onto magnetic data tape. The direct recordings were not of broadcast quality, says John, so they had to set up a regular TV camera pointed at a small black-and-white TV screen in the observatory to obtain higher-quality images that could be relayed to television stations around the world. The Goldstone camera settings to convert Neil’s descent down the stairs were not correct and showed an image too dark to see. So the decision was made to switch to the Honeysuckle Creek footage, and after eight minutes, to the Parkes footage, which was used for the rest of the moonwalk. It was this clearer footage, which had not been seen since 1969, that John and his search team were hoping to recover from the NASA archives, where the tapes had been sent.